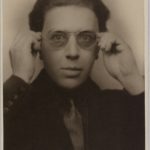 Andre Breton was a French writer, poet, and anti-fascist. He is known best as the founder of Surrealism. His writings include the first Surrealist Manifesto of 1924, in which he defined surrealism as “pure psychic automatism”. "I have always been amazed at the way an ordinary observer lends so much more credence and attaches so much more importance to waking events than to those occurring in dreams… Man… is above all the plaything of his memory."